bikes and biking | Park View, D.C.
Over the past several days I’ve been digging into the community amenities proposed by the redevelopment of Park Morton and thinking about ways to enhance and improve the proposal. 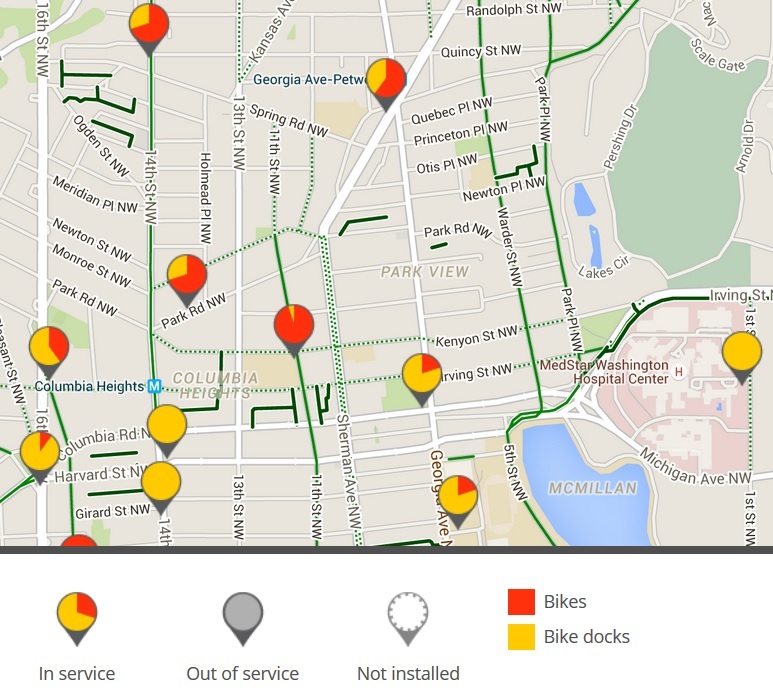 One thing that came to mind is the potential to improve the Capital Bikeshare program in the Park View area. While this may not sound like a big thing, a quick look at the locations of Bikeshare stations in the area, and how they are being used, gives an indication that the community is a heavy user of the system and there aren’t enough bikes or stations to go around. It also seems like the Park Morton development project could help enlarge the Bikeshare station that is currently at Columbia Road and even establish a new station on the 600 block of Morton Street with minimal impact to the project’s design or bottom line. It has been established for a while that our area tends to lose bikes over time as there are many residents who will bike to work, yet not all of them will bike back home after work. This requires Bikeshare to visit stations with a van to fill up the empty bike docks on a periodic basis. Looking at the same bike stations shortly after 9 p.m. shows the inverse relationship as there are many more bikes in the area — but also highlights that there are still many empty bike docks and some empty bike stations. Having another Bikeshare station on Morton Street would be of benefit to the community and help ensure that those who use this service would have an easier time of having an variable bike when they need one. 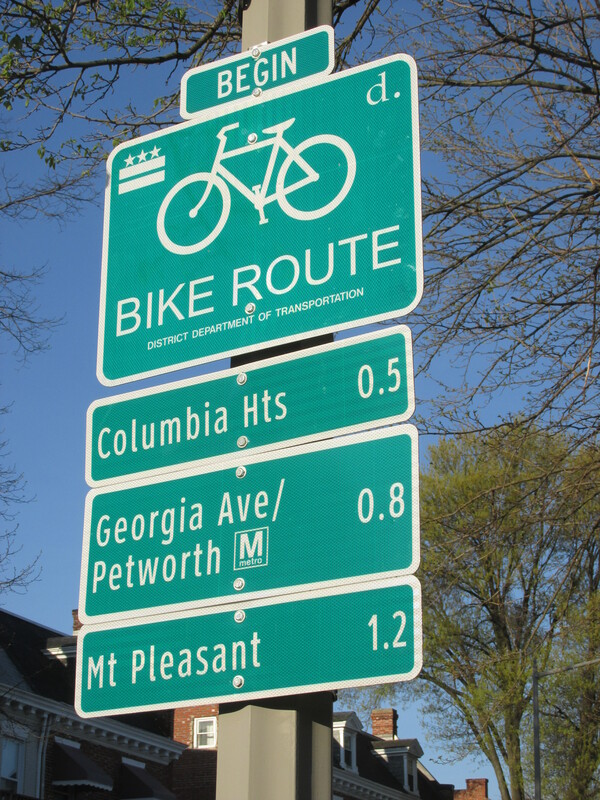 Yesterday I was informed that DDOT has installed new bike route signs along Park Road (between Park Place and Sherman/New Hampshire) and Monroe Street (west of Sherman/New Hampshire). I haven’t checked it out yet, but Newton Place between 14th and 16th streets may also be included. The signs are installed for both eastbound and westbound cyclists. 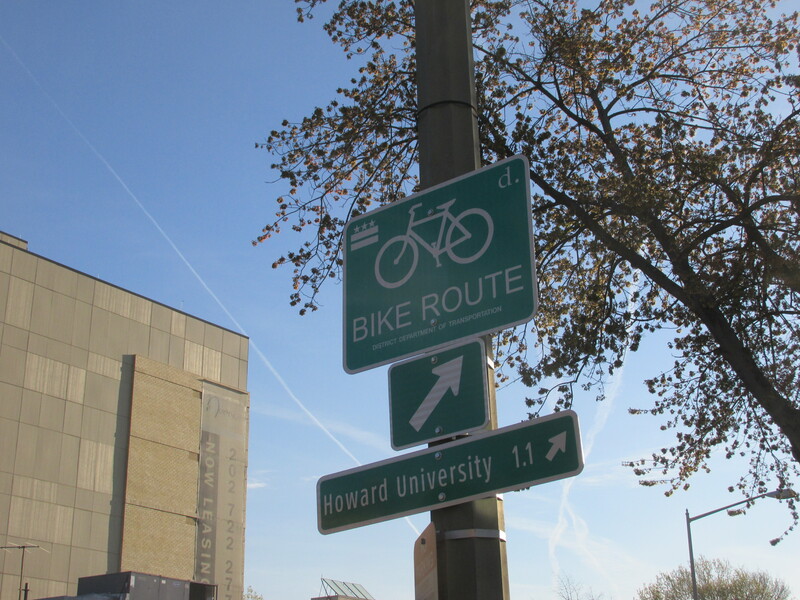 Along the route, the distance signs change and occasionally directional signage is included, which is necessary as Park Road jigs as it crosses Georgia Avenue, and destinations like Howard University or the Georgia Avenue Metro are not located on Park Road. While I’m a big fan of bike routes and think they are good, I also believe that dedicated bike lanes (and protected bike lanes) are better when possible. I’m hopeful to see DDOT’s current efforts with their Crosstown Multimodal Transportation Study result in additional improvements to our transportation network. New Seasonal Park on K Street — Could this Work on Georgia Avenue? 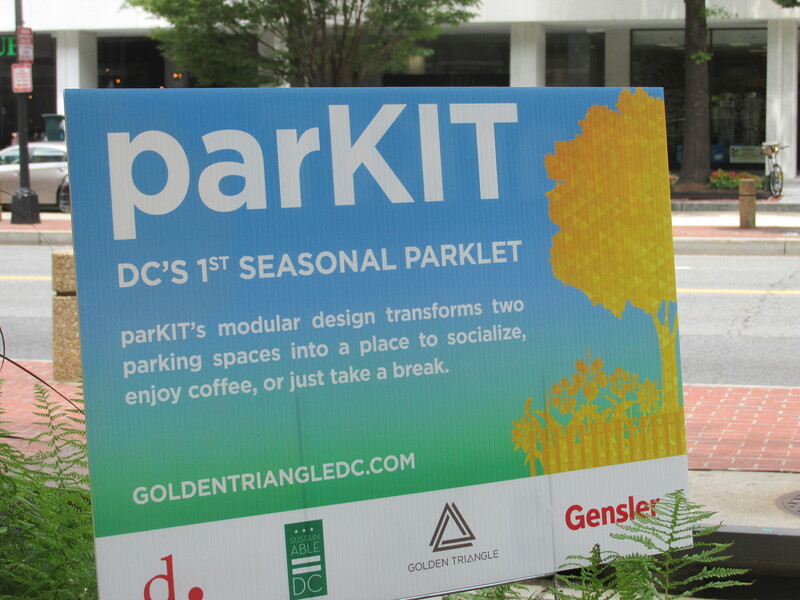 The ParKIT sign explaining the concept. 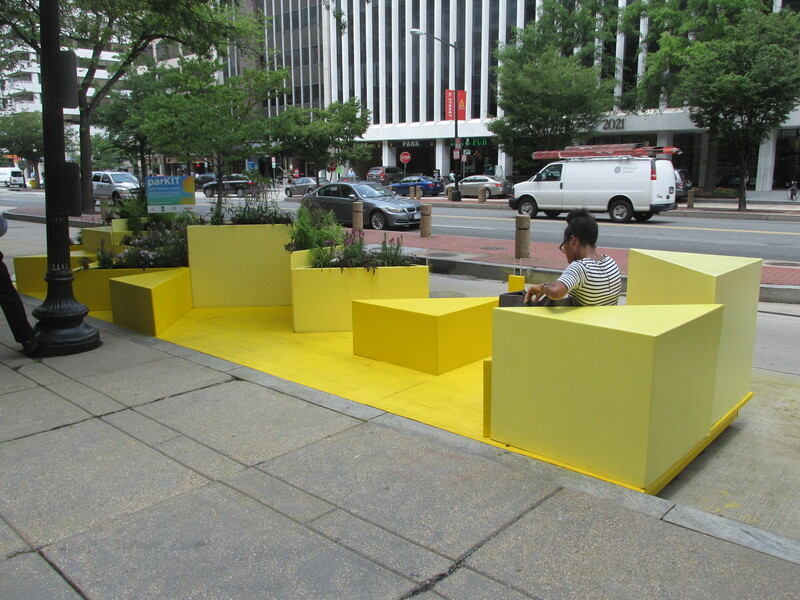 On Tuesday, a new Parklet was opened on K Street in front of the Gensler building at 2020 K Street NW. The seasonal park takes the place of two parking spaces. 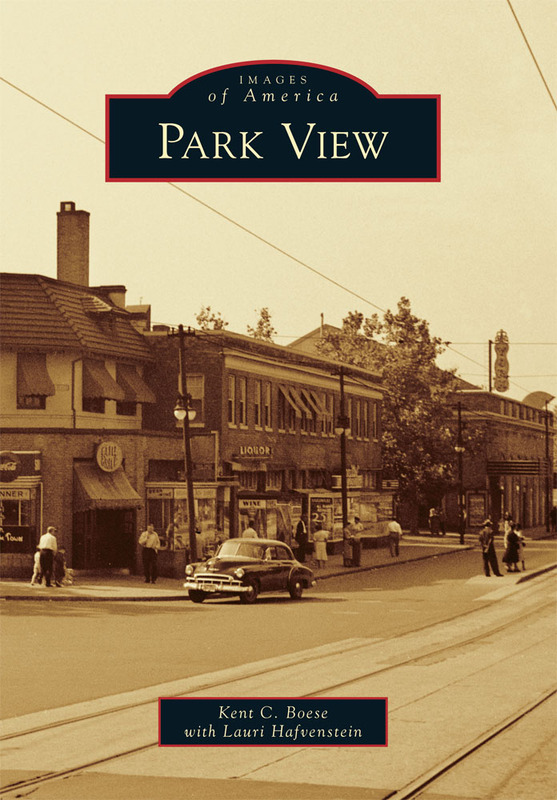 As I checked it out (and I know others in the community have also been thinking along these lines too), I wondered if a seasonal, temporary park would be something that could be done on Georgia Avenue. More-so, I wondered if a parklet could be paired with a bike corral in an area like DC Reynolds, Looking Glass Lounge, and Walters. One of the issues with Georgia Avenue is that the sidewalks are too narrow to accommodate outdoor cafe space. Furthermore, in an area like the 3600 block of Georgia, on a popular night their just aren’t enough bike racks to accommodate cyclists. If we could identify an area where three parking spaces aren’t needed, or, where the benefit of removing them for a seasonal park and bike corral would outweigh the loss of three spaces, we might be able to create the outdoor vibrancy that is definitely needed on Georgia. While the parklet on K Street is a great place to sit, read, and relax, these aren’t the only activities that could be accommodated. As the photo below shows, the space could also be configured as an outdoor cafe or summer garden. This is precisely the type of activity that would help enliven Georgia Avenue but that we can’t accommodate with our current sidewalks. So the questions become: 1) Would the community be interesting in swapping out a few parking spaces for some type of seasonal park? 2) What activities should this park support? 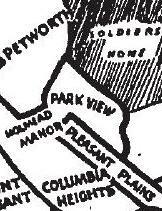 and 3) Ideally, where should this park be located? Possible new bike rack sites on the 3600 b/o Georgia have already been marked for evaluation. Last week I posted about the need for more bike racks on the 3600 block of Georgia Avenue, especially in the area near DC Reynolds and Looking Glass Lounge. 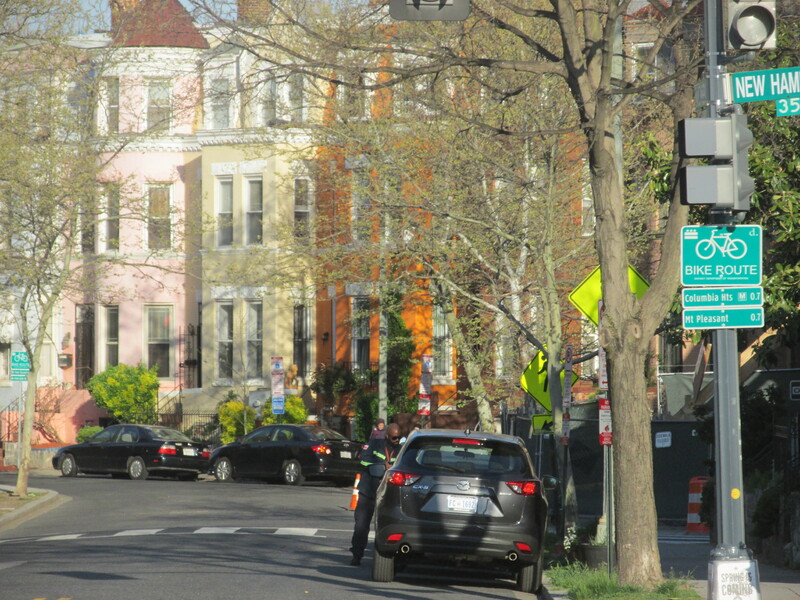 Since then, I have met with the Washington Area Bicyclist Association’s liaison with DDOT and the owner of DC Reynolds to review the biking needs of the street. 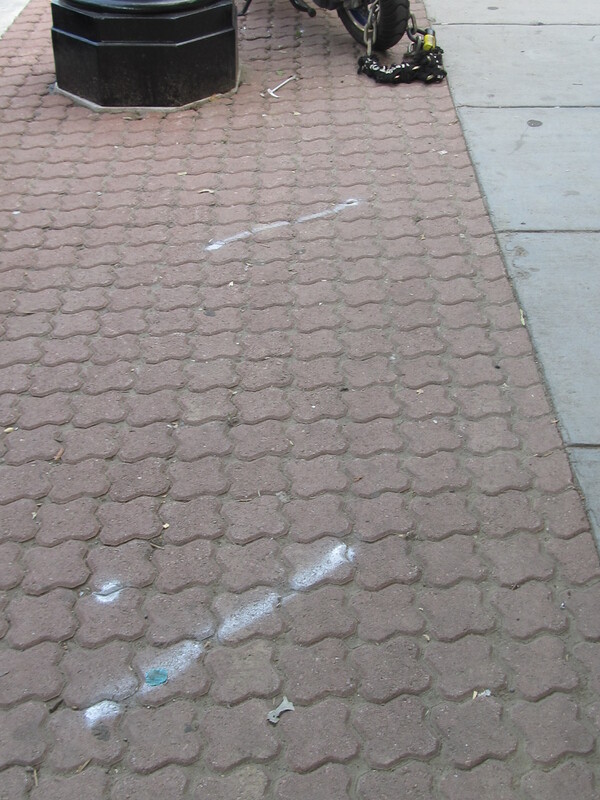 As anyone who visits the area now will see, possible new bike rack locations have already been painted on the pavers indicating where new bike racks might go. The plan as it currently stands is to install 4 more bike racks for the time being. Because the particular type of installation for the pavers requires large holes to be drilled about 12-18 inches deep, all locations need to be cleared through Miss Utility, which has already been contacted. 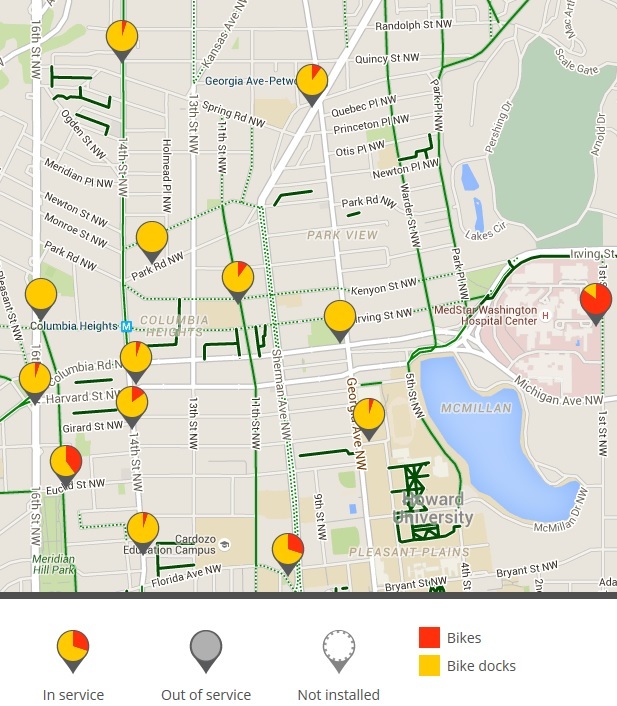 In terms of rack installation time, once the locations clear Miss Utility, installation of the racks will be scheduled with DDOT. Installation of the additional 4 racks should be no more than a month. Once these are installed, this stretch of sidewalk will be at capacity for bike racks. 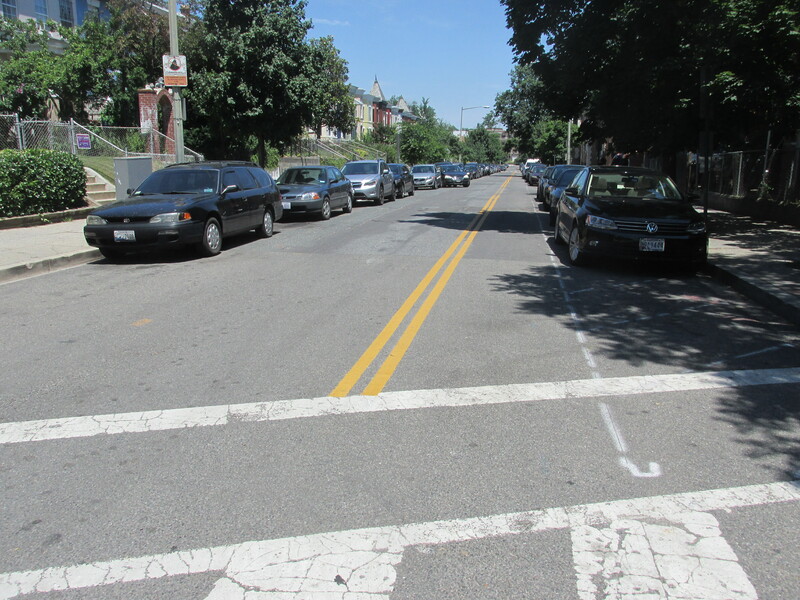 I have also asked DDOT about bike corrals since I know that demand for bike parking will only increase in this area. Bike corrals are going to take much longer to figure out however … and I’m not yet sure whether or not Georgia Avenue being a U.S. highway will be an obstacle or not. Still, should a bike corral be approved, I think the most promising location would be the northern-most parking space(s) on the west side of Georgia just south of Princeton Place. I’ll provide more details as they become known. I’m grateful to those who commented on last week’s post as they were helpful during Tuesday meeting.